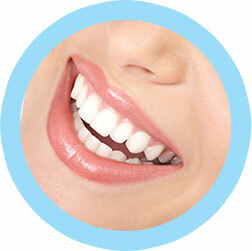 The foundation for a great smile is a commitment towards general dental care. Your six-month visits keep your teeth clean and healthy and help prevent problems in the future by letting us catch them early. We can address your individual concerns and build a relationship that ensures continuity of care. One important reason to visit the dentist is to have your teeth cleaned by a professional hygienist. Plaque and tartar develop on teeth over time. Plaque is soft and sticky, but daily brushing can usually remove most of it. However, plaque hardens into tartar, which is beyond the abilities of a typical toothbrush and floss. Tartar builds up below the gumline as well as on the surface of the teeth structure. If plaque and tartar aren’t removed, you risk more serious problems with your teeth and gums later. Recent research demonstrates a strong link between untreated gum disease and serious ailments such as heart disease, stroke, and diabetes. Having your teeth cleaned on a regular basis is one of the best things you can do to maintain good health. Teeth with damaged or infected roots used to require extraction, which can create a lot of problems and should be avoided when possible. The good news is that we are highly experienced in advanced root canal therapy. A root canal is a technique to repair a tooth by removing the tooth’s pulp chamber and filling it with a filling material. This is often needed when dental decay reaches the nerve of the tooth (or the tooth has become infected), and a standard filling won’t be suitable. Not too many years ago, the situation mentioned above would have required a tooth extraction. When dentists began performing root canals, they were quite dreaded, and the root canal has gained a reputation as something to avoid. However, with modern anesthetics and technology, root canals are usually manageable. Diabetic or Pre-Diabetic? We Can Help! Were you aware there is a link between dental health and your ability to successfully control blood sugar levels? And did you know not all dentists are equally prepared to help diabetics with their dental health? Untreated gum disease makes diabetes worse and diabetes makes gum disease worse. It can become a vicious cycle. You’ll be happy to know that we have received special training in dental care for diabetics. Please call us today for a complimentary consultation. Our team will never criticize you for having delayed dental care. You can be assured of compassionate and non-judgmental care. Just as our bodies evolve as we age, our teeth and gums do too. 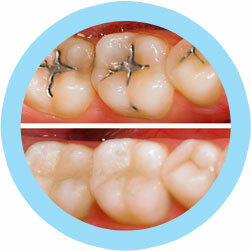 Years of plaque buildup, as well as consuming coffee, tea, or tobacco, can darken teeth. Ask us about procedures that can combat these issues. Reduced saliva flow is sometimes a side effect of medications. There are simple products that can help manage this condition. Your fillings are getting older as well. They can weaken or crack. Regular check-ups allow us to stay on top of your existing fillings. Gum disease and root decay can be problems with older patients. Daily cleaning and good nutrition are important for healthy gums. If your gums become red, start to bleed, or your teeth begin to feel loose, please contact us immediately. 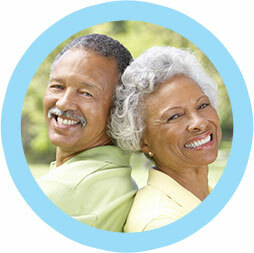 With advances in design and fit, we can provide beautiful, slip-proof dentures! This technique fits the denture plate so securely that you no longer need to worry about eating or that your dentures might shift or slip. If you wear dentures, be sure to ask us about this. It will make your life so much easier. Over the years, silver-mercury amalgam has been the standard filling material used by dental practices. They are effective, cost-effective, and usually covered by insurance. We also offer modern, state-of-the-art restorations that are a natural-looking white, contain no metal, and can actually strengthen teeth. One of the main reasons our patients are choosing the white bonded fillings has to do with the appearance—nearly invisible, compared to the metal filling. They also securely bond to the healthy part of the tooth, decreasing the chance of future decay. We are proud to provide both alternatives, and will be happy to discuss which option is best for you. Oral health can impact a person’s life more than regular cleanings and the occasional filling can address. Many patients who’ve dealt with injury, illness, bite problems, and general wear and tear can have chronic problems they don’t even realize began in the mouth. Bruxism (tooth grinding), TMJ, periodontitis, crooked or misshapen teeth, and missing teeth can result in headaches and migraines, toothaches, chronic bad breath, and an unattractive smile. But you no longer need to live like that. Dr. Lau will meet with you to discuss any concerns, symptoms, and goals. After taking digital X-rays, photos, and imprints of your mouth, he will present solutions for a treatment plan that addresses your issues to achieve a healthy, pain-free, beautiful smile. 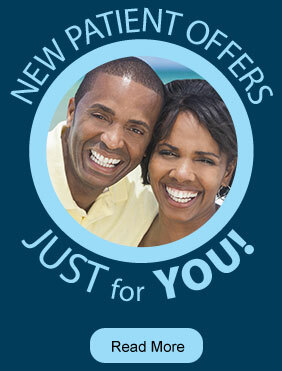 We can also discuss phased treatment and financial planning that makes it easier to put your dream smile within reach. If it’s time for your next cleaning, or if you’re ready to schedule a no-cost/no-obligation consultation, call us now at (718) 232-4044.